I've been putting off writing a review for this book because I still can't figure out what to say about it. It's steampunk Frankenstein, so if that sounds appealing to you then snap it up post-haste. If you're not a steampunk fan, well, know what you are getting into. 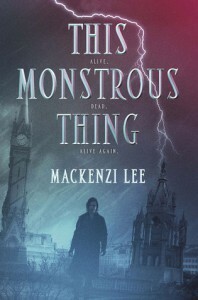 Lee does an excellent job evoking the past in all her books, and this one is no exception. The interesting thing is that she infuses her world with machinery and mechanical men. It almost has a cyberpunk quality in that so much of the book is concerned with the divide between machine and man, and at what point when adding machinery and subtracting flesh does a man cease being human. It's an interesting direction to take the story, and there are also some astute comments of disability and social standing. Where the book flagged for me was that I went into it wanting a story about brotherhood, and to watch these two brothers grapple with one another throughout the narrative. However, much like the source of inspiration, the two spend most of the book separated and only clash at the ending. This is all well and good, it's just not the story I wanted. While the book spent lavish detail and time exploring other characters and locales I found myself frustrated that it wasn't spending its time on things that interested me more. It doesn't feel fair to be critical of a book for not being what you want it to be, especially when it does a fine job in every other respect, but here I am. If you dig steampunk you will likely enjoy this book. If you like historical fiction with a twist you will likely enjoy this book. If you want to read an interesting re-telling of Frankenstein you will also likely enjoy this book. If you want a story of brothers at odds with one another, and an exploration of their relationship, this will likely not hit the mark for you.